Main prey for wolves here are blackbuck and livestock. Wolves occupy approximately 20 percent of the map shown with approximately 400-1,100 wolves living in the Himalayan Region and 4,000-6,000 wolves in the Peninsular Region. Range lines are not depicted. Wolves in the Himalayan Region prefer colder, steeper habitats while those in the Peninsular Region are mostly found in agropastoral areas that have less forest density (approximately 280,400km²). 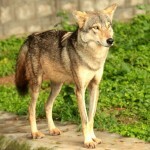 Wolves (Canis lupus pallipes) inhabit thorn forests, scrub-lands, arid and semi-arid grassland habitats in India. It is one of the common large carnivores found in the agro-pastoral regions of semi-arid India. Majority of the 2000-3000 strong wolf population of India survives outside of protected areas and in close proximity with people. These wolves primarily subsist on livestock. Rural India supports a very large cattle population and most people do not consume beef in several regions of India. The tendency of discarding cattle and buffalo carcasses that die of disease, old age, and starvation around villages, sustains high densities of carnivores like wolves, hyenas (Hyaena hyaena) and jackals (Canis aurius). Besides scavenging the wolf also predates livestock like goats, sheep and cattle calves. Wolf predation severely affects the economy of the pastoral communities (nomadic and resident) that barely manage to etch out a living from the highly over grazed and degraded landscape of semi-arid India. The pastoral community invests significantly in measures to protect sheep and goats from wolf predation. These measures include night vigils, maintaining guard dogs, building thorn corrals, and bringing the stock back to the village each night. The attitude of people towards wolves was related to the food-habits of wolves in that region. In areas where the wolf’s major prey were wild ungulates, people tended to view wolves with less hostility and rarely were wolves directly persecuted. Whereas, in areas where wolves subsist on livestock, peoples attitudes were extremely hostile and most of the wolf mortality observed was human related. 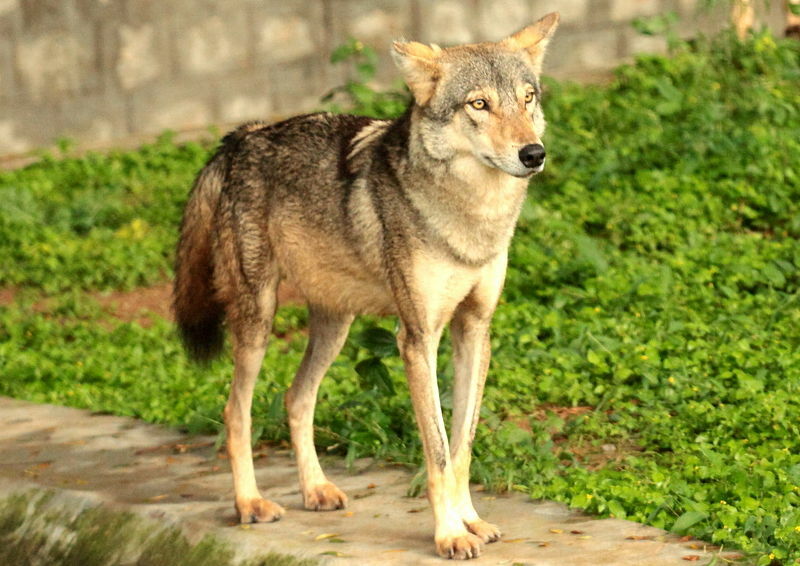 This analysis suggests that some form of economic compensation for wolf damage would help improve public attitudes towards the wolf in India. Military areas have been found to offer protection and suitable habitat for several endangered species in human dominated landscapes. A pack of 13 wolves using an Airforce and Army base in a semi-urban area in Maharashtra are currently being studied using telemetry. Wolves use these military refuges during the day and patrol paved, street lamp lit roads of the township during the night. They subsist by scavenging on garbage dumps of houses and by predating sheep and goats from hut compounds. These wolves have come into conflict with the airforce authorities since they chew and damage the arrest barrier net for restraining fighter aircraft. We are attempting to mitigate this problem by experimenting with chemical repellant sprays to prevent wolves from chewing on the barrier net. In the eastern part of the wolf’s range there have been several reports of non-rabid wolf attacks on children. This severe form of conflict reached its peak in eastern Uttar-Pradesh in 1996 when a wolf was found to be responsible for attacks on 76 children (of which over 50 were fatal). Sporadic fatal attacks on children by wolves have been reported in 1997, 1998 and 1999 from other parts of Uttar Pradesh. Our study suggests that in areas where there is high human density (600 km2) of low economic status, with little wild prey, and with livestock populations that are heavily guarded, wolves could potentially attack children. Radio-telemetry data from three different regions in western India suggests that wolves come into contact with humans very often. It would be extremely easy for wolves to attack children in these areas. However, no authentic reports of wolf attacks on humans are available from these regions in spite of these areas having high wolf densities. Our data suggests that attacks on children are exceptionally rare in comparison to the opportunities for attacks available to wolves in India. Such attacks are an aberration of wolf behavior and should be viewed within their special ecological and socio-economic context.